The 1993 One Pound Coin. The reverse shows the Ornamental royal arms which represents the United Kingdom. The design by Eric Sewell has been used on one-pound coins in 1983, 1993, 1998, 2003 and 2008. The Obverse is the portrait of Queen Elizabeth II by Raphael Maklouf. Mintage: 114,744,500 (may include coins issued as part of a set). Minted at The Royal Mint. The World Wide Web is born at CERN. Bill Clinton sworn in as President of the United States. European Union eliminates trade barriers and becomes a single market. 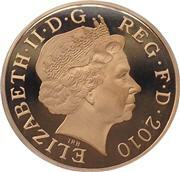 The 1993 One Pound Coin - Royal Arms (a British one pound (£1) coin) is a denomination of the pound sterling. Its obverse bears the Latin engraving "Dei Gratia Regina" meaning, "By the grace of God, Queen" and FD meaning "Defender of the Faith."